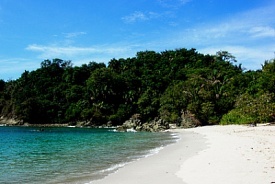 The tropical city of Puerto Caldera in the province of Puntarenas is located on Costa Rica's western coast and is an entry point for San José. Excursions to San Jose usually include a visit to the opera house, the crafts village of Moravia and a privately owned ranch. Some tours go past San Jose into the Poas Volcano National Park. Trips to Sarchi, known for its crafts, are also offered. Puerto Internacional de Caldera is located approximately an hour from Juan Santamaría International Airport. After exiting the airport, continue onto Radial El Coyol and stay on this road for 7km. Merge onto Autopista Jose Maria Castro Madriz/Route 27 for 50km, then continue onto route 23 and take the exit on the left. You will then arrive at the International Port of Caldera.